A couple of people recently have appeared on GIMP IRC channels wondering why no filters or layer operations seemed to work in GIMP, even though they had an image open. In at least one case, it was a setting most of us had forgotten about: the Auto button. It's easy to miss, but if you turn it on accidentally, you may be unable to do anything in GIMP until you realize what's happened. 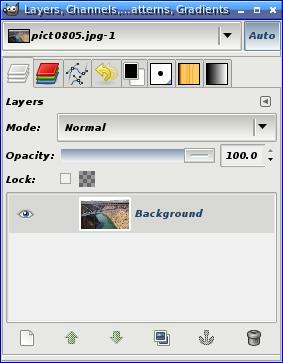 The Auto button is the one at the upper right of your Layers dialog. 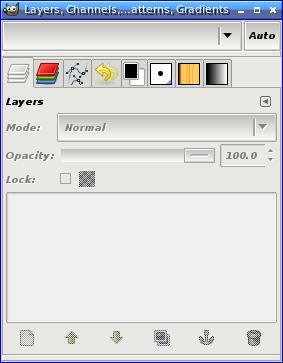 It's on by default, and what it does is ensure that dialogs like Layers, and GIMP's notion of the currently active layer, follow the active image. 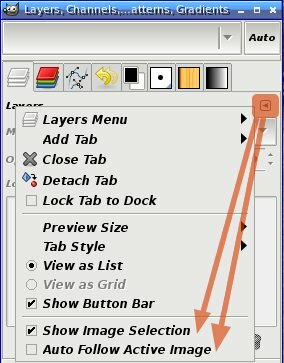 Open a new image, or click in a different image window, and your Layers dialog switches images -- so whatever you do next will apply to the image you just chose. If you turn Auto off, then by default, no image and no layer is active. Notice, in the screenshot at left, how no image is shown in the option menu just left of the Auto button. Even if you open a new image, you can't do anything with it until you explicitly choose an image from the menu. I'm sure you can see why this could be confusing. So why have that button at all? Well, it's useful when you're working with lots of images -- for instance, if you want to drag a layer from one image into another image, you can use the menu to switch quickly among images and layers without needing to bring those image windows to the front. I don't find I need it, but for those who do, I guess it can be a real time-saver. Just to make it even more confusing, not everyone even has the Auto button or the menu next to it. You can turn it off (and gain a little extra vertical space for your layers dialog) with the tiny menu button right above the mode menu. "Show Image Selection" controls whether the image option menu, and the Auto button next to it, will be displayed. "Auto Follow Active Image" is the same toggle as the Auto button itself. So if you ever get stuck and the Layers dialog doesn't seem to be showing layers from your image, and you can't figure out why ... remember that pesky Auto button. It might just be the problem. My mom got a netbook! A ZaReason Terra, in lovely metallic brown. (I know "metallic brown" sounds odd -- I was skeptical before I saw it -- but take it from me, it looks great.) It's cute and lightweight, with a nice keyboard with a clicky IBM-keyboard-style feel, and a meta key with a Tux penguin on it rather than a silly Windows logo. The only criticism so far is that the comma and period keys are narrower than the rest, so all three of us keep hitting slash when we mean period. It comes preinstalled with Ubuntu (currently 9.04 Jaunty) with a full Gnome desktop. I've never been much of a Gnome fan, but this time we thought we'd try keeping it for a while and see how Mom likes it. We can always switch to something faster, like Openbox, later. What stymied us, though, was the Gnome keyring and the way it prompts you for a password -- even if you've already typed in a login password -- whenever it tries to connect to the wireless network. Web searches revealed that we were far from the only people who found this annoying and wanted to turn it off. There are lots of howtos. Unfortunately, every howto is different -- apparently gnome-keyring changes its user interface with every release, but somehow none of these UI changes ever make it easier to find your way to the place where you can turn off the password prompting. So here's one for Jaunty. The key is a program called "seahorse", which you can get to via Applications->Accessories->Password and Encryption Keys. Click on the Passwords tab: you'll probably see two lines, login password and master password. According to some of the earlier howtos, these two passwords need to be the same in order for the following steps to work. Right-click on login password and choose Unlock (I'm not sure if that step is necessary, but we did it). Then from the same right-click menu, choose Change Password and make the new password empty. Of course, it will warn you about this horribly insecure behavior and how you're an idiot to want to do this. Your choice!